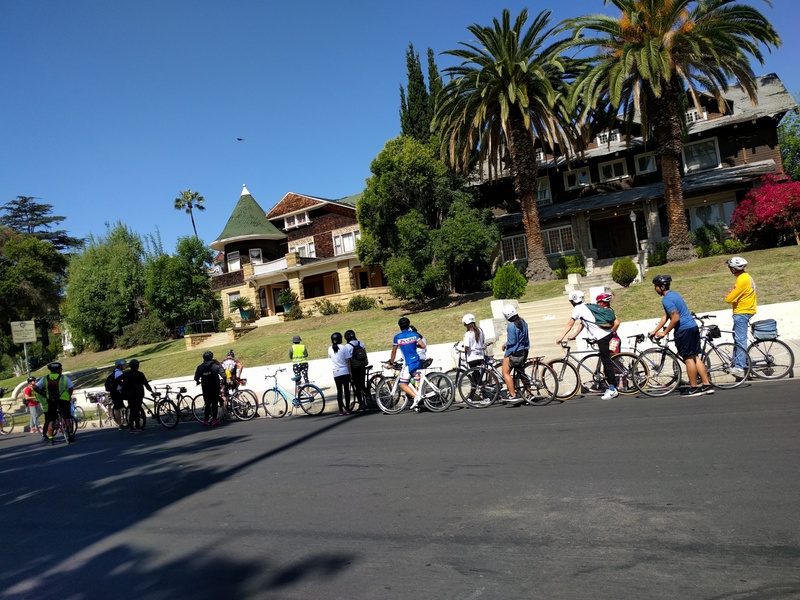 This past Sunday, APIOPA and The Wilderness Society hosted the Asian American Bike Tour during the Viva SGV Open Streets Event in El Monte and South El Monte. 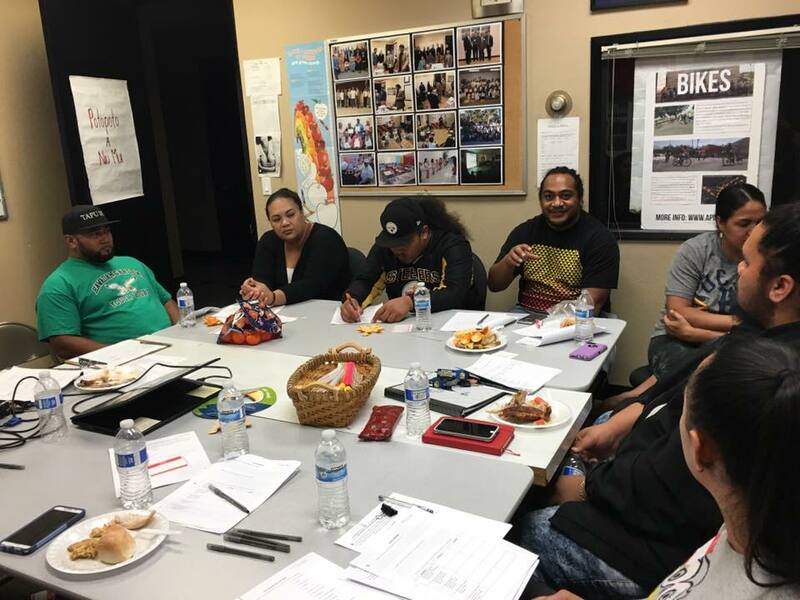 The goal of the tour was to initiate a dialogue by shedding light on the rich political, social, and environmental history of Asian Americans in the two cities as well as share the proposed National Recreation Area along the river corridors of the San Gabriel Valley. After the East San Gabriel Valley Japanese Community Center‘s Kishin Daiko‘s powerful performance at Arceo Park, we kicked off the tour at El Monte High School by its iconic lion statue. The city of El Monte was first established in the 1850’s and our tour guides, Dat Tran and Myca Tran, described its early settlers, lush landscape, and anti-Asian sentiment. On the way to our next stop we passed B Nutritious, a locally owned business serving healthy entrees, providing meal prep services and offering a free cookie with every Yelp check-in! We stopped at the Civic Center to admire the “Lady Liberty” statue donated by Taiwanese American immigrant Jiiang T. Wang, examined a photo of an old Japanese vegetable stand Dat uncovered from the El Monte Historical Society, and learned of the event that caused a chain of violence between two Asian American gangs across Southern California. We cruised through the many Korean owned businesses along Valley Mall, a charming street adjacent to the historic downtown area, and stopped at Veteran Park where we discovered the activist history of farmers of color at the Hicks Camp. 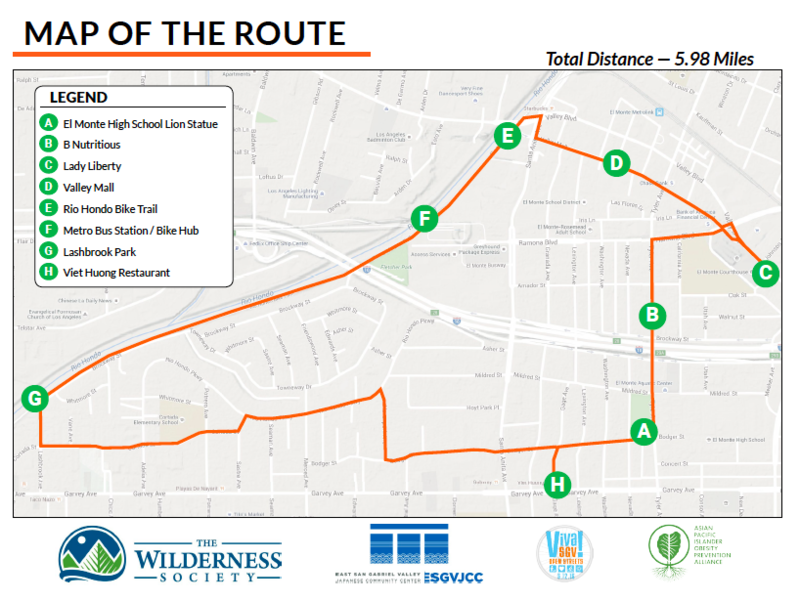 Duyen Tran from The Wilderness Society informed us on the proposed urban National Recreation Area and the effort to bring more pocket parks, walking paths, signage, educational programs, and other community-driven projects to local residents. 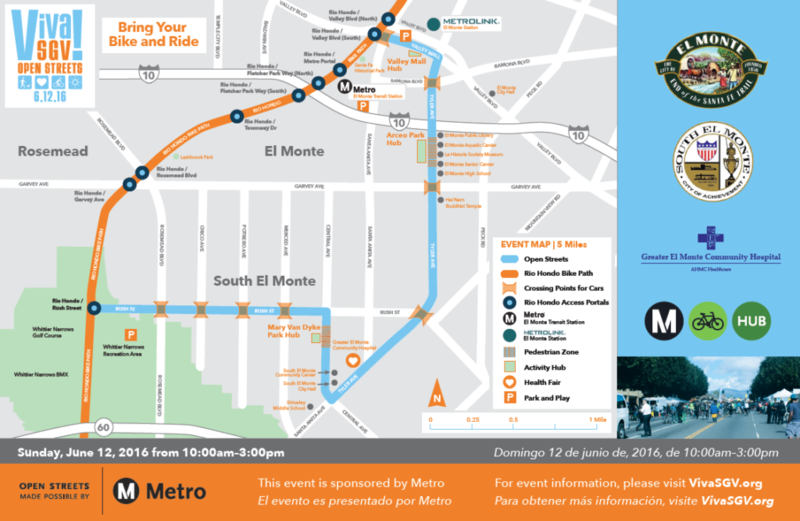 Shortly after, we hopped on the Rio Hondo River Bike Trail, we took a small detour at the Metro Bus Station where we stood in awe at Phung Huynh’s beautiful tribute to El Monte’s multiculturalism, “In the Meadow”, and dialogued around the new surrounding development’s impact on the community while sharing more about APIOPA’s work. Our last stop along the Rio Hondo River was Lashbrook Park where we delved into the Emerald Necklace Forest to Ocean Expanded Vision Plan, the amazing work of Amigos de los Rios, fun facts about the establishment of South El Monte in the 1950’s, and the city’s Asian Pacific American Heritage Month Proclamation. Following a quick stop by Bodger and Santa Anita to acknowledge the Thai garment slavery case that made international headlines in 1995, we heard insightful personal stories of immigrant struggles and triumphs amidst a diverse landscape. 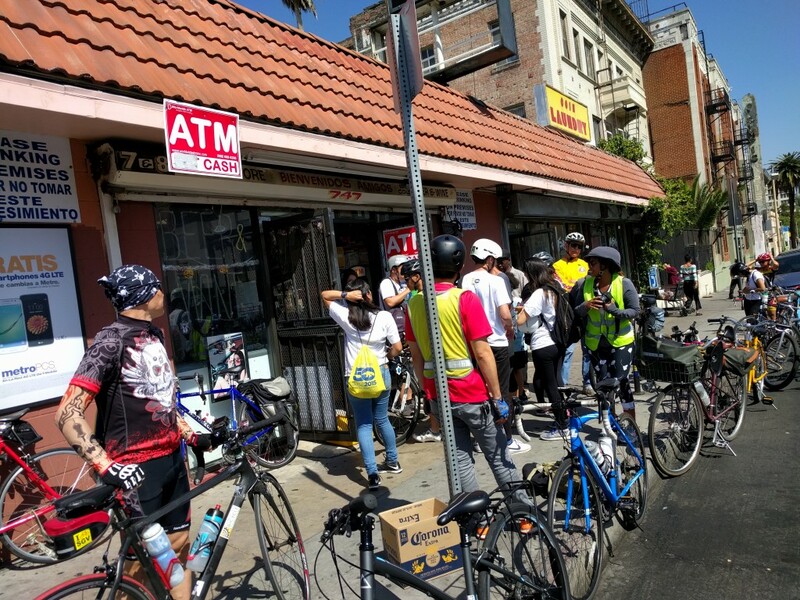 The entire bike tour wrapped up at Viet Huong Restaurant where co-owner Augustine Tran shared his family story, the positive influences of growing up in a predominately Spanish speaking community at the time, and how his father paved the way for the acceptance of Asian cultural foods through educating the LA County Public Health Department. 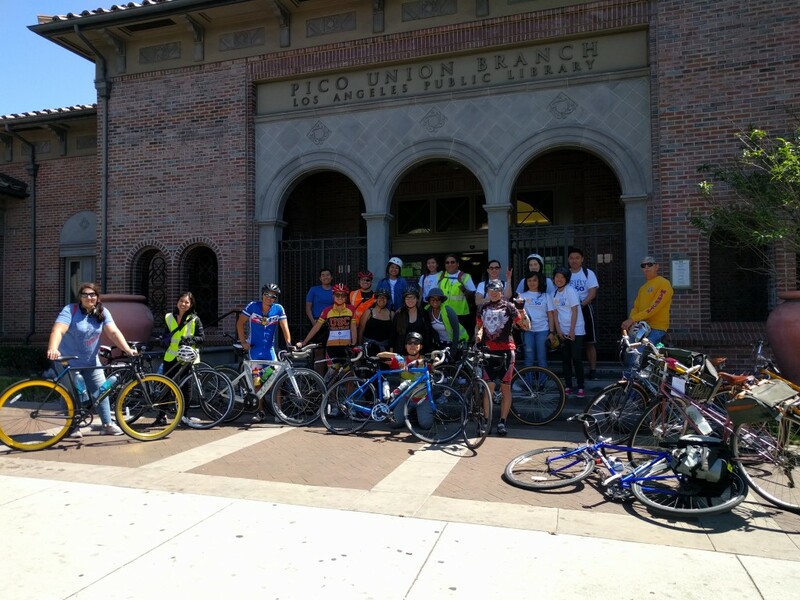 We look forward to exploring more Asian American history throughout the San Gabriel Valley via engaging bike tours in the future. 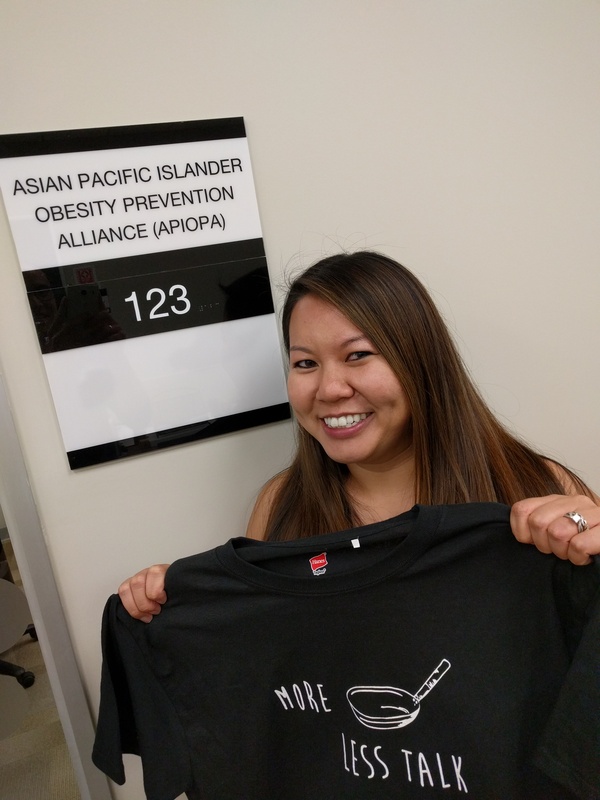 In the meantime, please be sure to look out for our video clips of the ride or check out #AsianAmericanBikeTour on Instagram and photos on APIOPA’s Facebook page! 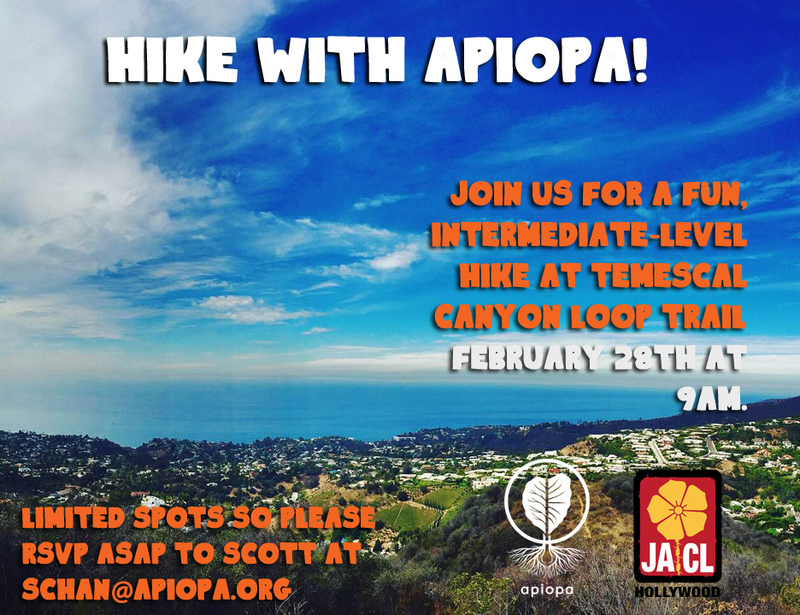 If you have any questions, or would like to learn more, please contact Myca Tran (mtran@apiopa.org). 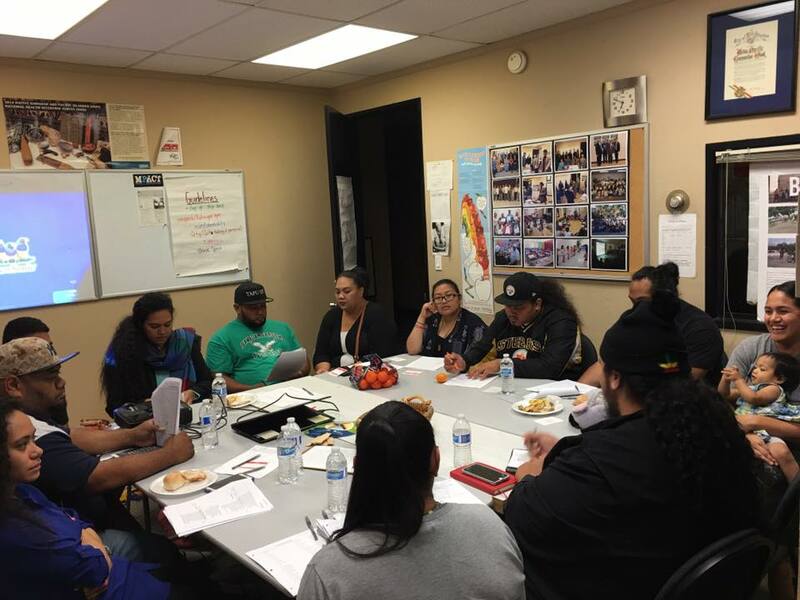 Last week FAB had its seventh session, and we explored the Tongan concept of Fatongia and how it relates to our physical, mental, emotional, and spiritual well-being. FATONGIA/responsibility – accountable for something within one’s power. 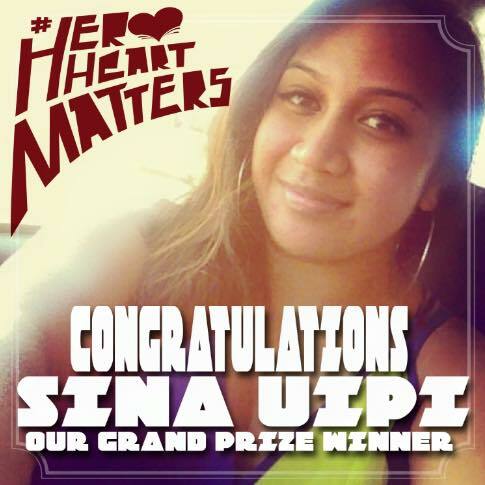 In Tonga, being active or longo mo’ui is a natural part of being a productive member of the home. 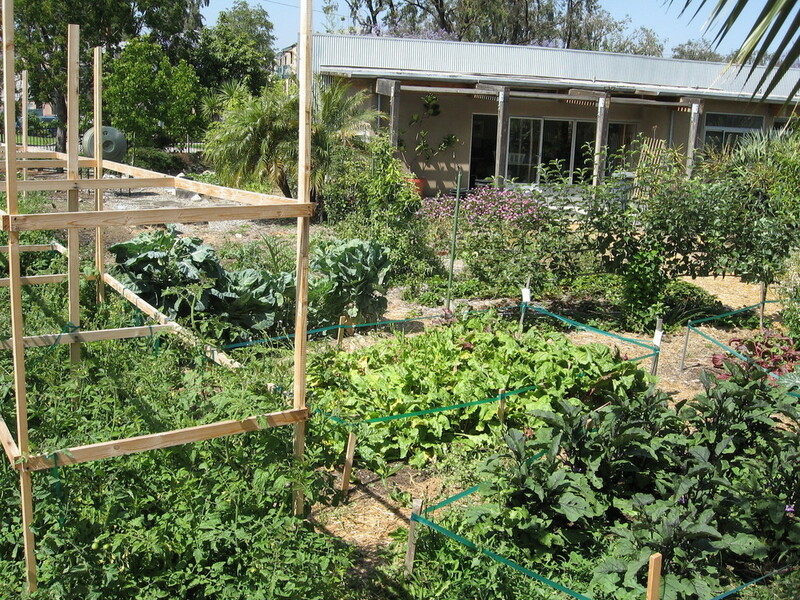 All members contribute to all work needed to maintain a healthy household. What is our fatongia in encouraging the same liveliness in our homes so we can foster a mindset of being active while contributing to the everyday lives of our families? Here in America, physical activity like going to the gym, is something you have to make time for, it is separate from everything else you do. In Tonga, you are constantly in a state of movement, not just physically, but mentally. Being active includes doing chores, mowing the lawn, doing laundry, cleaning the house, etc. It promotes a mindset of forward thinking and a lifestyle of planning ahead. So it’s something that is already built into your daily routine and holds you accountable to your fatongia. How can we apply the same thinking to our lives here so that we can be more active? 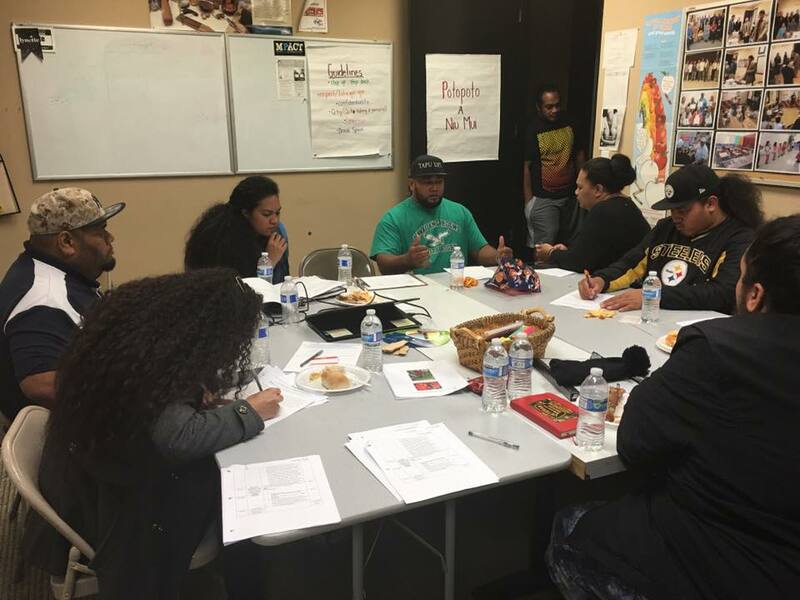 Special thanks to our guest speaker, Kuaine Taufa, for joining us and sharing some awesome knowledge about our proverbs. 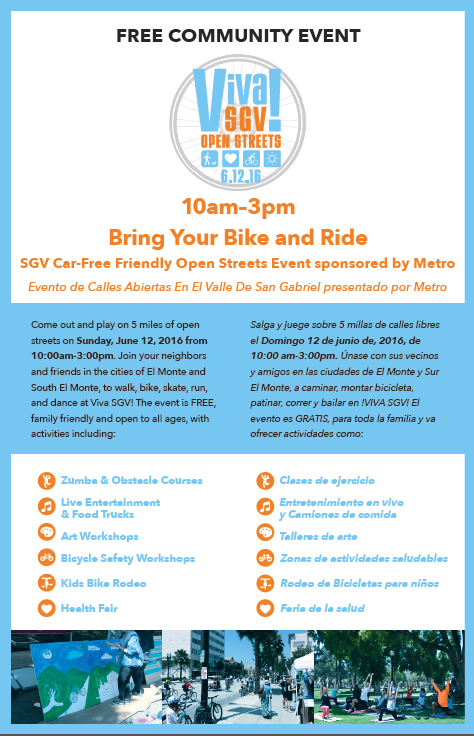 Join us for our next one, April 28, 2016!! 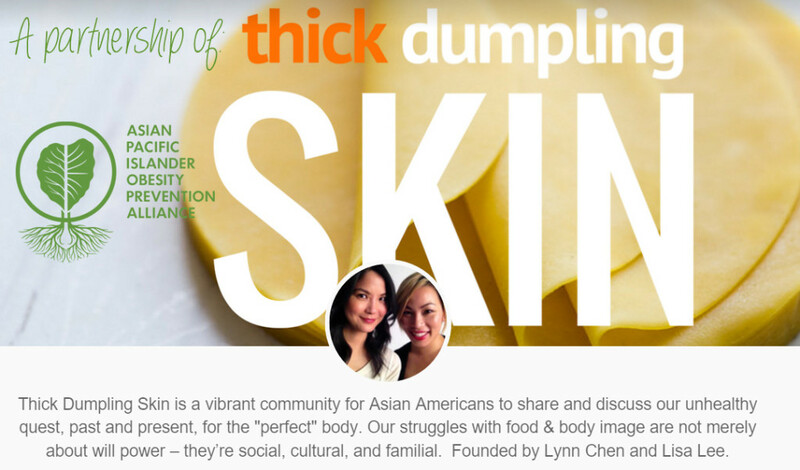 One of our awesome interns, Uyen Hoang, shares about her experience researching for the #IdealAsianBody social media campaign, a joint venture with our friends at Thick Dumpling Skin. There was laughter when we talked about how family spoons up critical remarks on weight and size at holiday dinners. There was laughter when we talked about the struggles of being the “fat one” in the family or if we had a sibling that occupied that role. There was laughter when we talked about skin whitening cream and how it fell into our hands. There was laughter when we talked about how extreme the beauty standards that we are inundated with from media and family are. There was laughter when we discuss the necessity for likes and affirmations on social media. There was laughter when we talked about how we or the people close to us skipped meals as a way of getting to a certain image. There was laughter when we talked about how we didn’t fit the images that we were pressured to strive for. I am compelled to wonder, why are we laughing? Laughter can heal but laughter can also mask much darker feelings. When we’re hurt, we can choose either to laugh or cry. I guess, from what I see in my groups, laughing is a better fix for body image and insecurity issues. But after a while and with so many groups, it gets a bit unsettling. Is laughter really the best medicine for this? What does it mean when we laugh at the pain we feel?